Oct. 28, 2016 - MPP for Eglinton-Lawrence Mike Colle visited Upper Village Paint & Wallpaper on this sunny autumn day. Mike bought some supplies and needed some guidance about a home repair project. 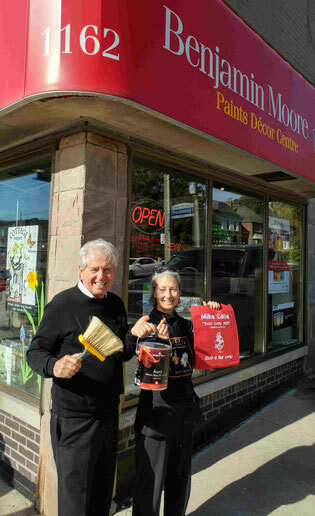 "Great local paint store at the corner of Glenarden and Eglinton just east of the Allen Rd.," Mike enthused. "Judith and Nick know their paint and even sharpen scissors and knives. Plus you get a chance to win a $100 local shopping coupon from Crosslinx who are building the Eglinton Crosstown Subway. Shop local; forget the Depot." Thanks to Mike for his generous comments which can been seen on his Facebook page here. It is our pleasure at Upper Village Paint & Wallpaper to serve as your local Benjamin Moore paint store. As Mike commented, in addition to doing colour matches, sharing expertise and selling paint and stain products, we offer additional convenient services. When kitchen knives no longer cut, we sharpen blades. When house keys are lost, we cut keys. When windows and screens need repair, we fix them. Also, customers can shop for custom closets, Amerock knobs and pulls, and Baldwin Reserve handlesets. As an independently owned Benjamin Moore store, we strive to identify products and services that anticipate the needs and desires of the neighbourhood. Key cutting, knife sharpening and window repair are the most recent conveniences on offer. It was a pleasure to meet and serve our MPP Mike Colle. Thanks to Mike for his generous comments which can been seen on his Facebook page here. We appreciate his efforts to help promote businesses like ours, businesses whose Eglinton storefronts are affected by the occurrence of ongoing subway construction.